I have a bit of an obsession with Monkey Bread. I love it and it’s just so easy to make. 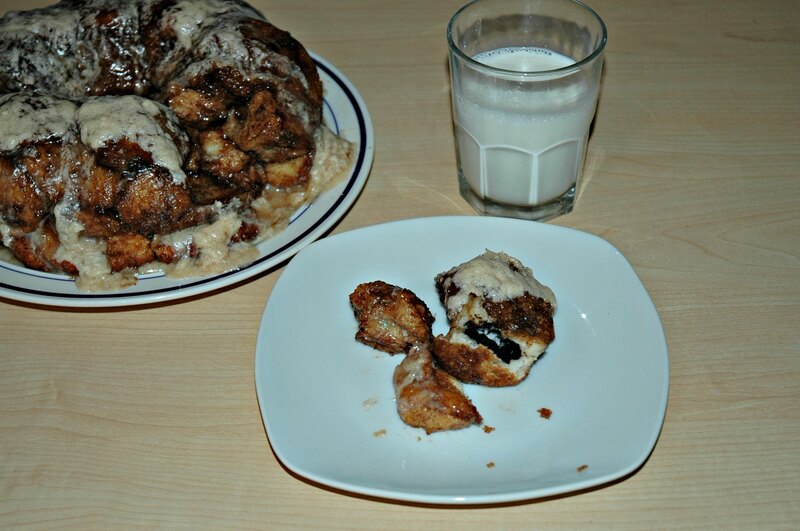 This time I bring you Oreo Stuffed Monkey Bread. I’ve seen Oreos stuffed in cookies, brownies, truffles and many other treats. I like and appreciate all of those too but I wanted to incorporate the Oreos into my new favorite dessert. Every bite of this Monkey Bread has Oreo in it. I think you’ll love it as much as I do. I used the mini Oreos in the recipe but Double Stuff Oreos are a favorite. Next time I’ll use those cut into quarters. What is your favorite Oreo? Step 1: For the Dough: Mix the milk, water, melted butter, sugar and yeast in a two cup measure. I used a microwave safe glass measure and heated the milk and water at full power for 1 minute, 20 seconds to reach 110 degrees. In the bowl of a stand mixer, add the flour and salt. Using the dough hook attachment, start the mixer on low. Add the milk mixture slowly. Scrape down the sides of the bowl as needed until the flour is incorporated. Increase the mixer speed to medium (raised my KA to the 5 setting) and let it knead for another 6 to 7 minutes. If the dough looks overly wet, add 2 tablespoons of flour at a time and continue mixing until the dough forms a mass. Spray a large bowl with cooking spray. Transfer the dough to the bowl and spray the dough also. Cover the bowl with a clean dish towel and use my tip below to aid the rise. Let the dough rise until doubled. If using my tip, it will double in 45 to 60 minutes. If not, it may take 1 to 2 hours. Step 2: For the coating: As the dough rises, combine the brown sugar and cinnamon in a bowl. Place the melted butter in a small bowl. If you would like to dial back the sweetness and gooeyness of the recipe, use the lesser amounts of sugar and butter. Set aside. Step 3: For the shaping the dough balls: Sprinkle a clean work surface with flour. Transfer the dough onto the floured surface. Spread and press the dough into about an 8 inch square. Cut the dough into 8 by 8 slices with a bench scraper or knife. This will give you 64 pieces. Shape each dough ball around an Oreo and shape into balls and place back on the counter. Repeat with the remaining dough balls. Step 4: Spray the bundt pan with cooking spray. If any of the dough balls have reopened, pinch them together to fully enclose the Oreo and create a uniform ball shape. Dip each dough ball into the melted butter mixture individually. Then roll them in the brown sugar mixture until they are well coated. Place the dough ball into the bundt pan. Layer the dough balls so they are offset and the dough ball on top is placed on the seam of dough balls below. Repeat preparing the dough balls until they are all in the pan. If there’s any remaining melted butter, drizzle it over the top of the dough balls. If there’s any remaining brown sugar, sprinkle it over the top of the dough balls too. Step 5: Cover the bundt pan with a clean dish cloth or plastic wrap. Let rise until puffy and until they are about an inch or two from the top of the pan. Mine rose to the top of the pan. If using my oven tip below, let rise for 45 minutes. If not, let rise for 1 to 2 hours. Step 6: Bake unwrapped 30 to 35 minutes in a preheated 350 degree oven with a cookie sheet underneath the pan. I’ve found that at least one or two dough balls try to escape during baking and the cookie sheet prevents them from burning on the bottom of the oven and causing a ton of smoke. When done the top should be browned and the coating begins bubbling a bit. Let bread cool in the pan for a maximum of 5 minutes. Any longer and it may be difficult to depan. Invert bread onto a large plate. Step 7: For the Icing: While the dough cools a bit, add butter and mascarpone cheese to a large mixing bowl. Beat 2 minutes. I beat them on high using a hand-held mixer. Beat in vanilla extract and cinnamon. Mix in the powdered sugar at a lower speed (this prevents having powdered sugar everywhere). Mix in the milk. If you want a thinner icing, add more milk in teaspoon increments until you reach desired consistency. While the bread is still warm, spread the icing on top of the bread – the icing will drizzle down the sides of the dough. Serve warm or cold. Recipe inspired by Cooks Illustrated. Tips: If your house is chilly like mine always is and your dough doesn’t rise, you can boil a pot of water while preparing the dough and place the water and dough in a cold oven. The boiling water will create a warm moist environment in the oven for the dough to rise well. Leave the oven light on and it will add to the warming effect. This post may also be entered in these linky parties. Click the here to visit the other great posts in the blog hops. This entry was posted in Dessert, sweet bread and tagged cinnamon, Oreo, yeast bread by Annamaria @ Bakewell Junction. Bookmark the permalink. this looks delicious and I know my kids will love it! Your kids will absolutely love this. Oh my! this sounds incredible. Pinning on my Man Food board because this is a guy thing! We’re a Double Stuff family! 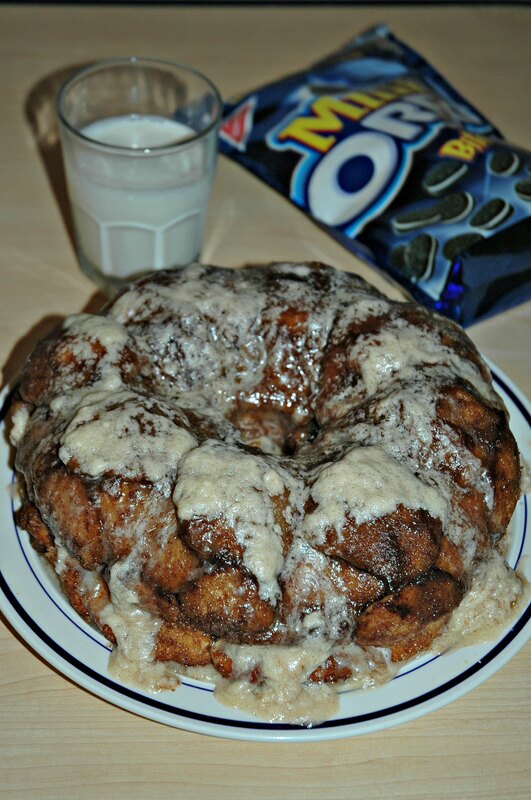 Wow, I never thought of using Oreos in monkey bread…how wonderful!!! Oh wow. This sounds amazing! I have had monkey bread once and it was pretty awesome, and oreos are my favorite cookies. Very excited to try this! The first time I made Monkey Bread it became my new obsession. I had to laugh at your comment about being obsessed with Monkey Bread. Mainly because I still haven’t made it! Oreos could just be the push I need…or at least my son needs to convince me (he loves Oreos…any an all). This looks yummy. I make a similar version w/o the chocolate. It’s great without the Oreos too. Great tip on how to raise the bread in the oven, my house is too cold too so I need that trick! I love the vanilla oreos, wonder if it would be as good? Probably not, nothing is as good as the original oreo!! Pinning to save for later baking! I’d love to hear how yours turns out. So glad he’s getting back to normal. It’s one step at a time. This looks too good to be true!! Yum yum. It’s really good and addicting. Oh. My Goodness!!! I love monkey bread and have never thought of adding oreos. What a great idea. Thanks for linking up with Hump Day Happenings! I hope you will join us again next week. Thanks. It was a big hit with everyone. You say “Oreos” and I come running. Double Stuffed are my absolute favorite, so I think I would definitely substitute those in the recipe. Thanks. I’ll be doing the same next time I make them. I’m hosting a giveaway, I would love if you would follow along and enter to win! Thanks. This is really a delicious treat. oh my, this has got to be an absolutely sweet treat that I can only eat a little bit of, otherwise, it would be gone in one sitting! Great recipe, thanks for sharing and linking up again with us at the #WWDParty! Have a wonderful weekend! This monkey bread is so addicting. It’s hard to keep from eating it in one sitting. I saw this at Camille’s hop and came to visit. It looks delicious! Thanks, always happy to share with friends. That looks so good. I want to try it! Thanks. This such a decadent and gooey dessert that I think everyone should try it at least once. I love sharing all my treats. G’day! I have VERY fond memories of oreos! YUM! Oh my decadence in dough! This looks great! Thanks for sharing on Whatever Wednesday on Thank You Honey! Your recipe looks amazing! Can’t wait to try it! Hope you have a fabulous week! What a great idea stuffing monkey bread with oreos. Thanks for linking up to Sweet and Savoury Sunday, stop by and link up again this weekend! 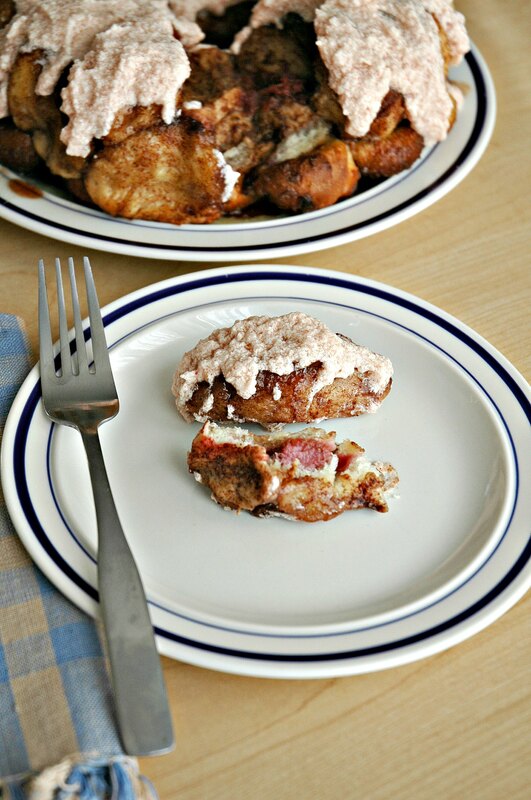 I love baking monkey bread too – and your Oreo Stuffed version looks incredibly tasty! Thank you so much for sharing it with us at The Hearth and Soul hop, Annamaria. Your Stuffed Monkey Bread looks fabulous! Thank you so much for sharing your special recipe with Full Plate Thursday. Hope you have a great week and come back soon! YUM!!!! I really need to try this. I have made Monkey Bread before but not stuffed! Thank you for linking up to Tell Me About It Tuesday on Woman of Many Roles! Well, I didn’t think anyone could make monkey bread any better, but i was wrong. It sounds delicious! Thanks for linking up with the Tasty Tuesday’s Link-up. I have pinned your post to the Tasty’s Tuesday’s Pinterest Board! All I can say is: OH YUM!!! I love Monkey Bread, and this sounds so good. Thanks so much for linking up to last week’s Weekend Wind-Down party! I’ll certainly be sharing this! Mmmm…. oreo is fabulous! I just made monkey bread for the first time, and it really is easy and delicious! In fact, I made it twice in one week! I’ll definitely be giving this a try! Thanks for sharing at Saturday Dishes, I’m pinning your recipe! It’s so unbelievably good. I was hooked with the first one I made. Oh my goodness – this is so wrong but oh so right! Thanks so much for sharing this at the Friday Frenzy!